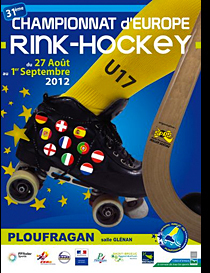 This seasons International tournaments will soon be upon us starting with the Under 17 European Roller Hockey Championships in Ploufragan, France. This year in the first phase eight teams split in to two pools will compete and start the journey for the european title. This CERH competition is the championship for counties to show their upcoming players with their skill and tallent for the first time. The action starts on Monday 27th August with Andorra v Portugal then two other matches before the Opening Ceremony. England will face the hosts France in front of a full house including dignitaries and VIP’s for the regional councils and sports administrators.